← Save $50 on Your Holiday Feast & Make it Look like you Hired a Chef! 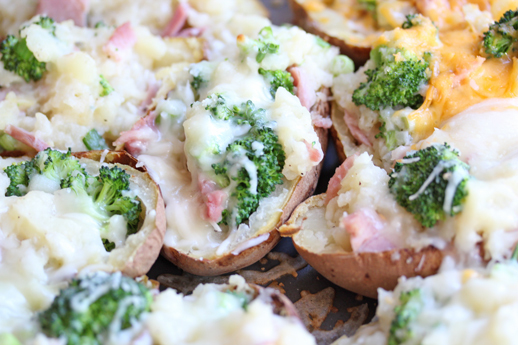 Twice baked potatoes…as a one-dish dinner. Duffy T, a long time friend of $5 Dinners, sent my a note about the way they do twice baked potatoes. They turn them into an entire meal by adding either chicken or ham and broccoli and the cheese to mixture. I made these just before leaving town for Smuckers earlier in the week. I had two as I ran out the door…leaving the rest of the meal behind for my husband and boys to enjoy. While on the drive up to Orrville, something monumental happened. Back story…several months ago my husband decided to switch his cell phone service to a “pay as you go” plan. He’s not much of a phone talker, not much of a texter and decided it would be worth the savings to drop him from the monthly plan and go to a pay as you go plan. The texts on his plan cost $$$. Nothing ridiculous, but enough that he chooses not to text often. I smiled…and didn’t text back. Because that would cost money. I waited until we talked when I got to my hotel…and he kept raving and raving! Poke the sides of the potatoes with a fork, place on baking sheet and bake at 400 for an hour, or until soft in the middle. May take longer for larger potatoes. Reduce heat to 350. Remove from oven, slit lengthwise and scoop out cooked potato flesh into mixing bowl. Stir in milk, butter, salt and pepper as you would for mashed potatoes. You may need more than 1/2 cup of milk and 1/4 cup of butter…just make mashed potatoes as you would normally. Mix in ham, broccoli florets and green onions. Spoon the mixture back into the shells. Top with shredded cheese. Bake at 350 for 15 to 20 minutes, or until cheese has melted. 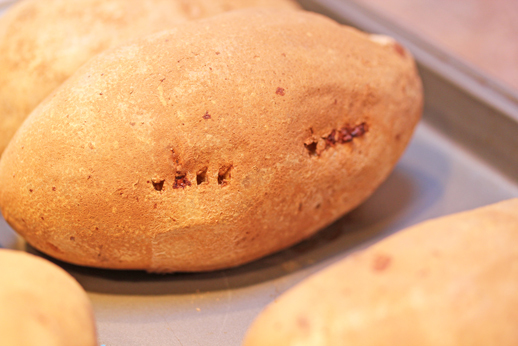 Serve Twice Baked One-Dish Potatoes, hot out of the oven. Looks good! Do you use cooked or raw broccoli? I used raw florets, as they cook to a perfect crunch. But you could certainly use cooked if you prefer. Erin – I was able to set up my ziplist but for some reason this recipe doesn’t have a save button – how can I add it? Tremendous things here. I’m very glsd to look your post. Thanks a lot and I’m taking a look forward to ouch you.